Stereolithography is a 3D printing technology that uses photopolymer liquid that hardens when exposed to UV light. Stereolithography was developed by Charles "Chuck" Hull, who patented the technology in 1986. Hull also founded 3D Systems in the same year. First, the user creates a 3D model using a 3D modeling program and saves it as an STL file. The STL file is then sent to the 3D printer’s interfacing software that slices the model into sections and determines how the part will be printed. 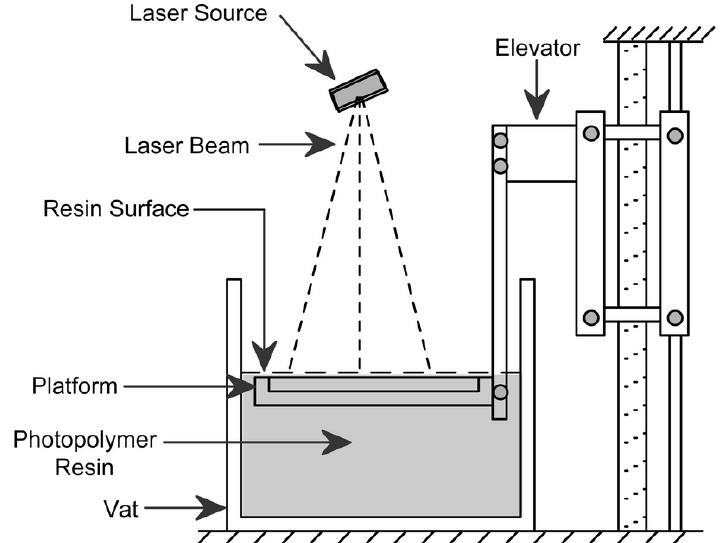 Then a vat of liquid resin is exposed to an ultraviolet (UV) laser, which traces a layer of the 3D model image onto the resin. The exposure to light causes a layer of the resin to harden. The build platform rises and the resin is again exposed to the laser. This process repeats until the part is complete.